You would have seen this today if Gustav hadn't appeared and screwed things up. 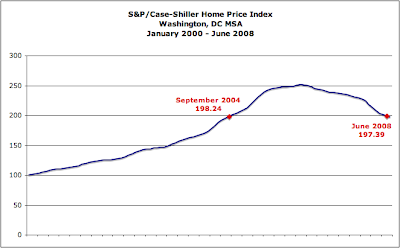 The S&P/Case-Shiller Home Price Indice report for June 2008 was released this week. It "shows continued broad based declines in the prices of existing single family homes across the United States, a trend that prevailed throughout 2007 and has continued through the first half of 2008." 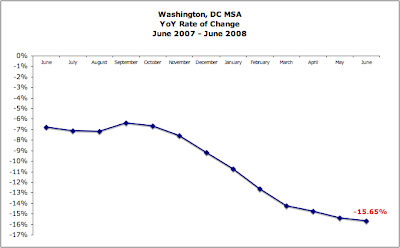 The data show that the Washington, DC MSA is still suffering home price declines [see the charts below]. 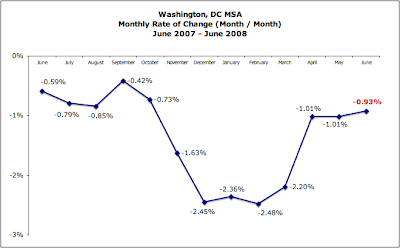 Effectively, the DC area's home price index has fallen to slightly below that of September 2004. In line with the national data, our area's rate of decline slowed in June. 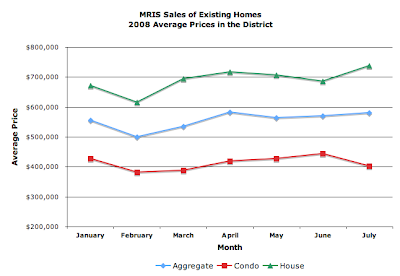 BTW, I know all the arguments about whether this data is truly applicable to DC, especially since it omits condos. It is what it is. 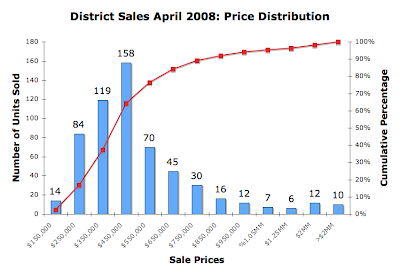 Now that I've completed most of my travel for the month [save for New Orleans, Gustav willing] and fixed a few infrastructure issues, I've [finally] finished my analysis of full value residential sales the District recorded in April 2008. 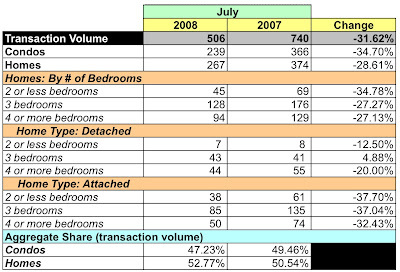 It wasn't a good month - huge declines in the number of units sold and dollar volume. Thirty two units each sold for more than $1MM. Those 32 units, at a total dollar volume of $67,577,000, were 5.49% of all units sold but 23.04% of April's dollar volume. Excluding them from the analysis lowers the aggregate average sales price 18.57%, to $409,649 [vice $503,077]. 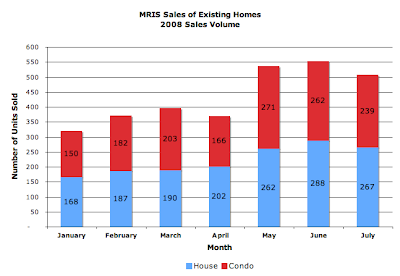 In April 2008 the District recorded 583 residential sales. In general, the average price fell 3.55% and the median price fell 6.64%. 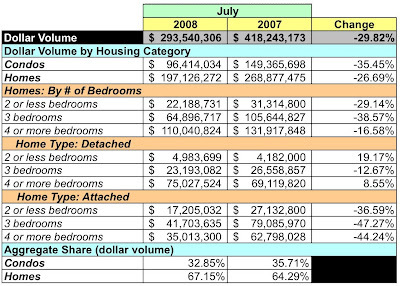 More tellingly, unit sales declined 20.14% while dollar volume fell 22.97%. 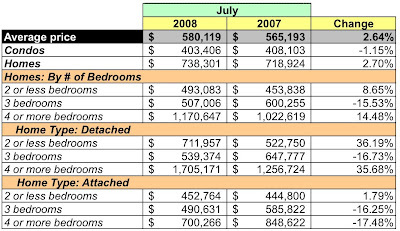 However, results for the condo market looked especially dire: unit sales down 28.23% YoY and dollar volume down a whopping 38.08%. 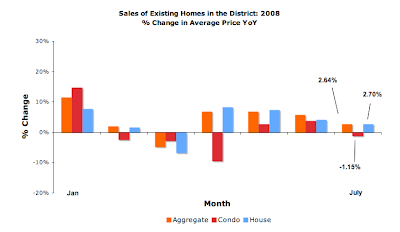 Although not as bad, single family home sales didn't escape the month unscathed. While average prices rose a slight 1.94%, the median price fell 10.94%, the number of homes sold fell 9.29%, and the dollar volume declined 7.54%. Fell, down, lowered, declined. I need a thesaurus. Wards 6 and 7 had higher sales volume; Wards 7 and 8 had positive growth in median prices; and Wards 3-6 had declines in average sales price. Ward 8 had the steepest drop in sales volume, dropping almost 71%. Strikingly, condo sales dominated 5 of the 8 wards. Condo sales ruled sales in Wards 1 and 2 - no other word is applicable. 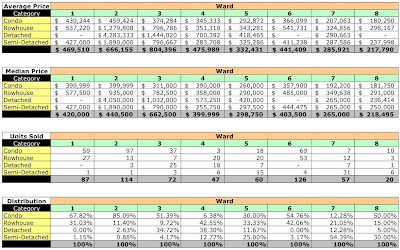 In Ward 1, 67.82% of sales were condos; Ward 2, 85.09%. 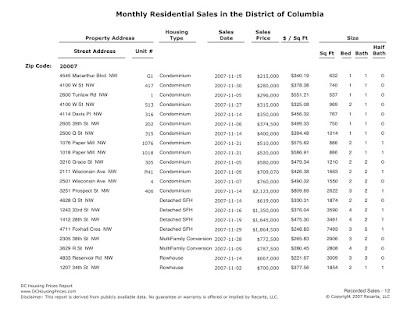 Ward 2 accounted for the most condo sales in the District, 32.3%, followed by Ward 6 at 23%. The chart below shows the distribution of April's recorded sales by sales price. Overall demand for single family housing is down 9.29%, as measured in unit sales. 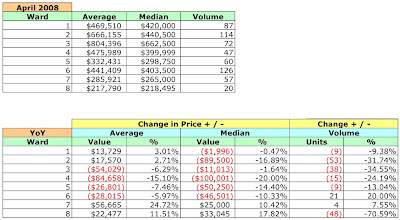 Average prices were up a meager 1.94% and median prices were down 10.33%. 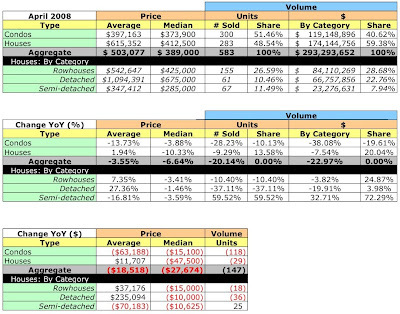 Semi-detached homes had a great month in terms of units sold and dollar volume. 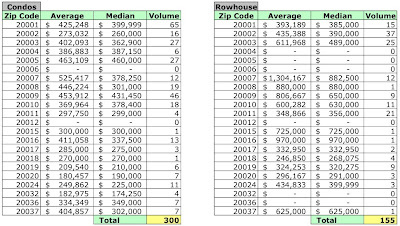 April 2008 average and median sales prices and unit volume by zip code. 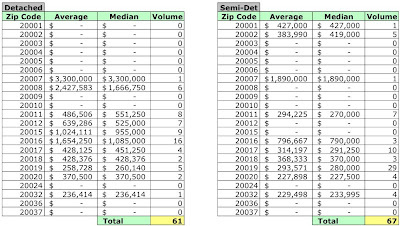 Summer's almost over and I've finally been able to process and upload the District's sales data for April 2008. May's data is still not completely available; maybe by Halloween. It can be viewed on DCHomePrices.com and DCCondoPrices.com. Analysis forthcoming, after we return from our weekend trip to Kansas City. One other item to note: I've spent a lot of time over the past few days improving my CAMA database, which is the database of the physical attributes of each property in the District. That database allows me, among other things, to calculate each sale's price/square foot. More importantly, the changes I've implemented will enable me to provide current information; no more disclaimer about 6-12 month delays in data availability. P.S. For those who've asked, the partner's fine, it's benign! I'm trying something new and would appreciate your feedback. I've analyzed quite a few condo buildings in the area over the past 2 years. Unfortunately, I rarely update a condo's profile once it's been posted and I can guarantee you there's some old, creaky data out there. To "fix" that problem, I'm researching whether a wiki would help. The idea is that I'll put all the condo analyses on the wiki and those who have more current information - and no agenda - can update or improve the entries. So I've created a wiki, DCHousingPrices, and prepopulated it with a few postings. It's configured to accept anonymous users. Check it out. I'd appreciate feedback on whether this is worthwhile and if there are issues with the platform provider I've selected. Again, no agendas and no puffery. I'm still working on April's sales data, but travel and my partner's hospital stay have delayed my progress.